Every May, thousands of Atlantic bluefin tuna (atún rojo) swim through the Strait of Gibraltar at over 30 miles per hour to spawn in the Mediterranean. 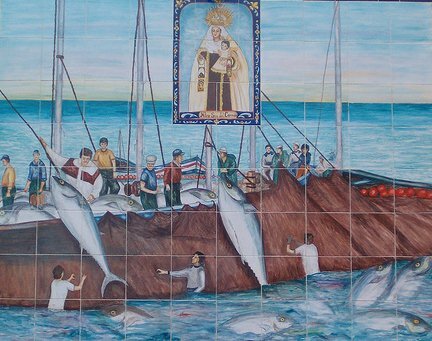 And for 3000 years fishermen have intercepted the large tuna in a fishing tradition called the almadraba in Andalusia and tonnara in Sicily. The almadraberos are often sons, grandsons, and great-grandsons of almadraberos, and feel a brotherhood with their fellow fishermen. They tend to be proud and tough, with a strong respect for history and the sea. 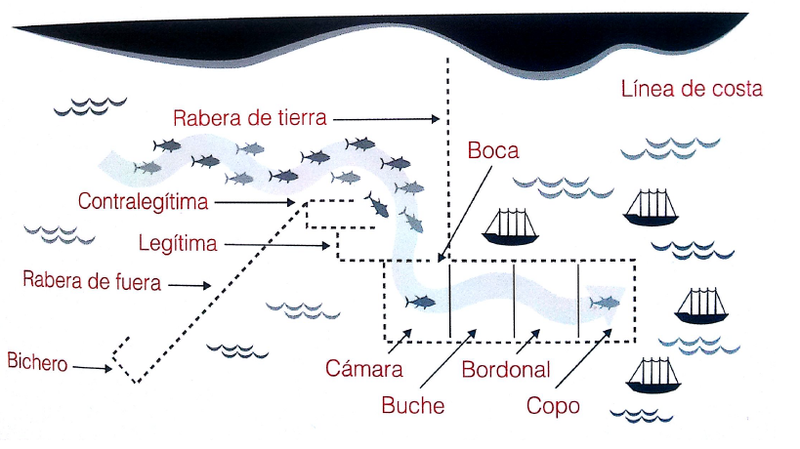 They catch the tuna by putting out a maze of underwater nets that the bluefin swim through until they reach a final pool, el copo (diagram of a net, below). Tuna swim east to the Mediterranean, going through various areas of the net until they reach the “copo,” where they are hoisted up out of the water. Once the copo is filled, the fishermen circle their boats, working together to haul the huge net to just a few feet below the surface—the levantá del atún, or “raising of the tuna.” There are so many tuna jumping around in such a shallow space above the net that it creates the illusion that the water is boiling. At this point the copejadores assume the treacherous task of jumping down into the net to hook and hoist the often 1000 pound-plus tuna, whose tails may be longer than the fishermen are tall, into the surrounding boats. Most copejadores have suffered many injuries over the years: broken knees, ankles, wrists, and noses. Some people call the practice slaughter, equating it to what they perceive as the savagery of bull fighting, while others perceive it as a noble tradition. So what is endangering the historic almadraba tradition? 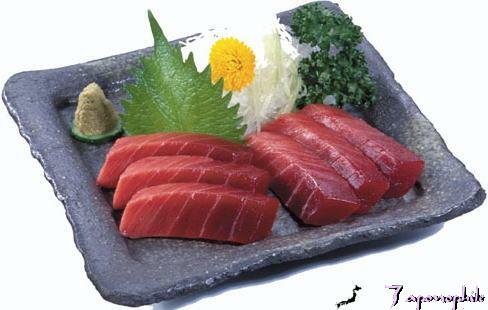 Tuna have been overfished: there are half as many bluefin tuna in the Atlantic as there were 39 years ago. Some almadraberos report that they used to catch 1000 tuna a day, whereas now they are lucky to catch that amount in an entire season. The Atlantic Bluefin Tuna (thunnus thynnus) has been listed as endangered by the International Union for Conservation of Nature (IUCN’s “red list”) since 2011. But conservationists do not generally blame the almadraba for the species’ decline. Technology such as sonar tracking and huge vessels have brought stiff competition to traditional fishing methods such as the almadraba. 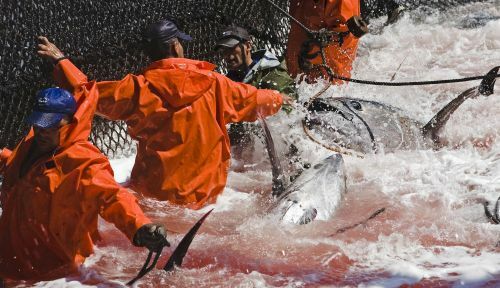 Most research that I have seen in a web search equates overfishing to the larger, high-tech vessels and, ironically, to tuna farming—fishermen catch the young bluefin and then fatten them up in farms—rather than to traditional fishing methods such as almadraba. Do you like sushi? Japanese regard the cold-water Atlantic bluefin as the best fish in the world for sashimi, and atún rojo has turned the southern Spanish coast into a gastronomic destination. With prices for bluefin in Tokyo’s Tsukiji fish auction higher than ever (you’ll remember one fish sold for $1.8 million in 2013), demand has skyrocketed, which has resulted in the overfishing. 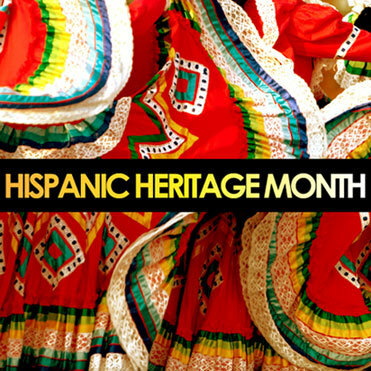 What traditions in your culture are in danger of extinction? How do we determine if it’s time to let go of a practice and flow with the changing times, or hang on to our ancestral practices? 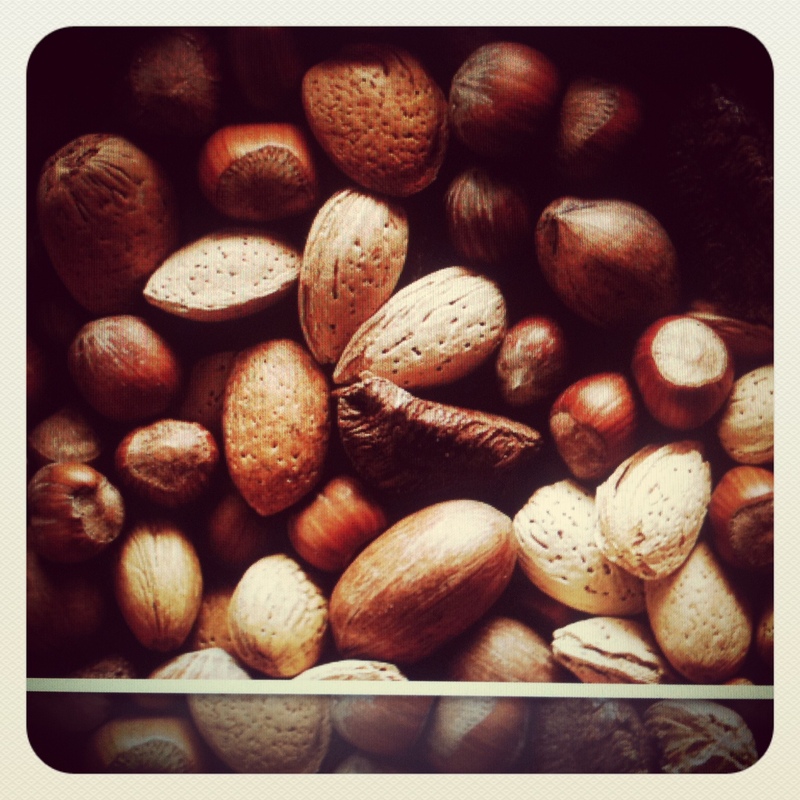 And, what makes a tradition a tradition? Have Difficult Economic Times Changed Our Values? 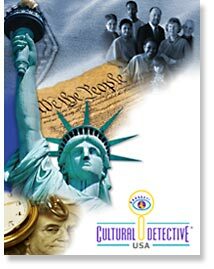 Working with Cultural Detective over the years, I am always interested in the role values play in our lives. So I was eager to read a new working paper for the Council on Foreign Relations released by Pew Research Center pollsters Andrew Kohut and Michael Dimock, entitled Resilient American Values: Optimism in an Era of Growing Inequality and Economic Difficulty. We in the USA are a nation of optimists. We believe that with hard work we will get ahead. “Unlike Europeans, they [US Americans] believe that they themselves, not larger forces in society, determine whether they will be successful in life.” And, in spite of the recent difficult economic times, US Americans continue to believe that it is through their own initiative they can and will succeed. Although the economic situation in the US has changed radically in the last 25 years, research finds that this shift has not drastically changed our values. This research indicates that the core Cultural Detective: USA values of Self-reliance (It’s up to you) and Capitalism (Reach for the American Dream) are alive and well throughout all levels of US society. However, what really caught my interest in the paper was the research that showed US Americans are upset not by rich people being “too rich,” nor by the widening economic gap between the rich and the poor, nor by the large drops in wealth and income among most in the last decade. To the contrary, US Americans are most concerned by the apparent unequal nature of the economic system, and a government ideologically paralyzed and unable to institute meaningful reform. Sounds to me like the results of this study also suggest that the CD: USA values of Equality (Level the playing field) and Law and Order (Play by the rules) remain an integral part of the society. We want the same opportunity to work hard and get ahead as everyone else—even those with far more money and power than we ourselves have. While there is great diversity in our ranks, perhaps this study has once again shown us what unites us as US Americans. We invite you to take a look at this study—it is full of interesting information about US values and attitudes. We’d love to hear how you see your cultural values playing out in difficult economic times. A Czech and a Jamaican walk into a…. relationship. And BAM! There we have it — my reality in a nutshell. Building my relatively new multiracial, multicultural blended family has been quite the ride: challenging, but worth all the energy, inspiration and personal transformation that the experience has brought about. The key to making things work has been clear, open and respectful communication and a willingness to self-examine and adjust, while staying authentic and standing one’s ground about the key values that must remain uncompromised. As my sweetie and I say, if he and I can’t work through our differences, how can we ever expect the rest of the world to do the same? In our case, in addition to the divergent racial realities we experience in this society (he as a black male, and I as a white female), the contrast between our upbringings and home community cultural values is quite vast. Our parenting styles mirror those which guided each of us, and they are nearly polar opposite! The parenting of our children from previous relationships, in fact, has been the hottest point of contention. My style veers towards the permissive side of the spectrum which gives the child the time and freedom to construct his own internal moral compass experientially through empathy (of course, not totally without guidance). This parenting tendency reflects how I was brought up and is, in a way, indicative of the degree of the privilege, which has applied to me since childhood, to be generally relatively safe, and sheltered from strife. My partner’s parenting method is authoritarian, bent on instilling strong discipline and ethic as a means to survive and thrive in a sometimes harsh world. His is a form of tough, protective love, “a strict and clearly defined” style, as he calls it. You could see how these vastly different philosophies could drive us nuts, but we are on a journey together, determined to respect one another and find meeting places somewhere in the middle. In fact, an interesting pattern is developing where we, the parents, are adopting a little of each other’s tactics as we evaluate which are useful for our particular circumstances. In short, we are really mixing it up in the mixing bowl that our family is. What I am most excited about is that we are learning from each other and drawing on not only the richness of what was passed down to each one of us, but also from each other’s worlds. My hope is that this, for our children, rather than confuse, will open new doors and encourage new ways of seeing the world and interacting with the people in it. “As an ethnic minority woman working in a large multinational firm, too often I feel like I have to learn only, to fit in. For the first time since I’ve worked here, I can now see, and explain, the unique and valuable perspective that I have to contribute as well!” she said, her face positively glowing. The privilege of experiencing such affirming responses from Cultural Detective customers is part of what makes my job so incredibly worthwhile. 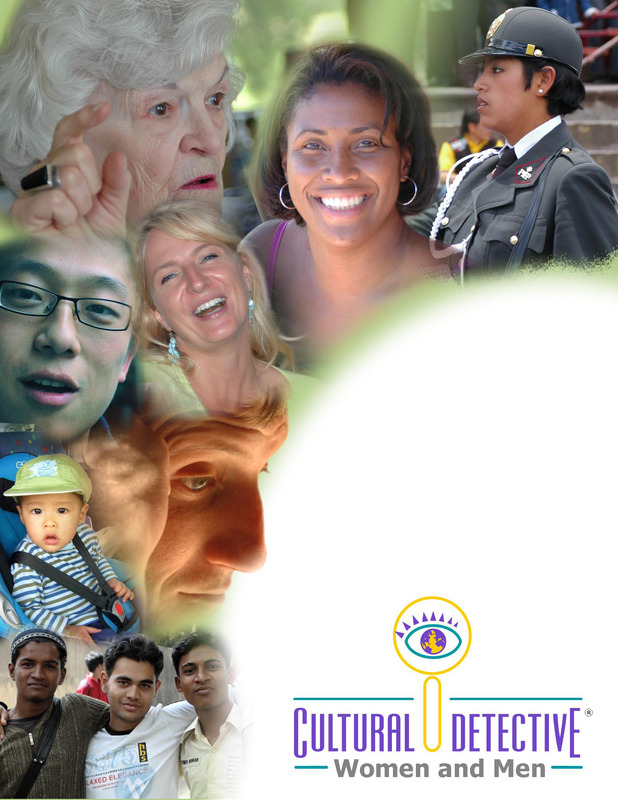 This woman had just spent time creating her personal Values Lens, using Cultural Detective Self Discovery as well as a selection of Values Lenses from various other CD packages. 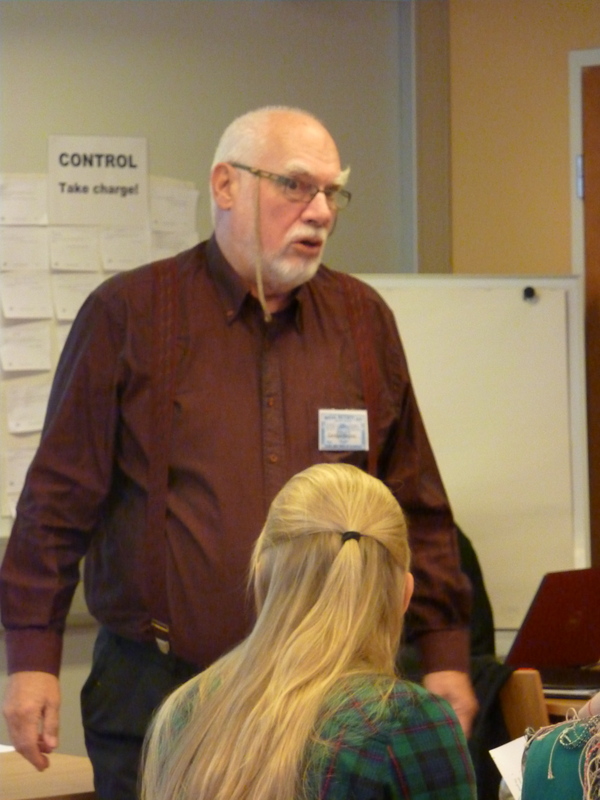 While the core of Cultural Detective is its process, which enables ongoing learning, collaboration and conflict resolution, the Lenses play an invaluable supporting role. 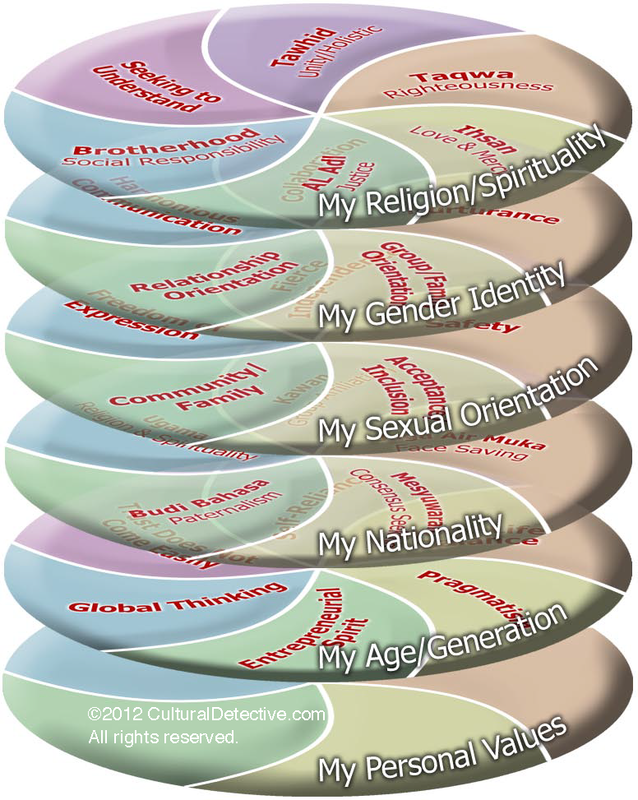 As shown in the diagram above, one important role the Lenses can play is to help us realize that we are all unique, individual composites of the various cultures that have influenced and helped form us over our lifetimes. We are not “just” Chinese or Brazilian; we are much, much more than a single story, as Chimamanda Adichie so well told us. In international cross-cultural work such as I’ve done over the past 34 years, too often people limit their definitions of “culture” to “nationality.” Culture goes way beyond nationality. Since by definition culture is the shared norms, values and behaviors of a group of people, culture can also include ethnicity, language group, physical ability or mobility, sexual orientation, or gender identity. 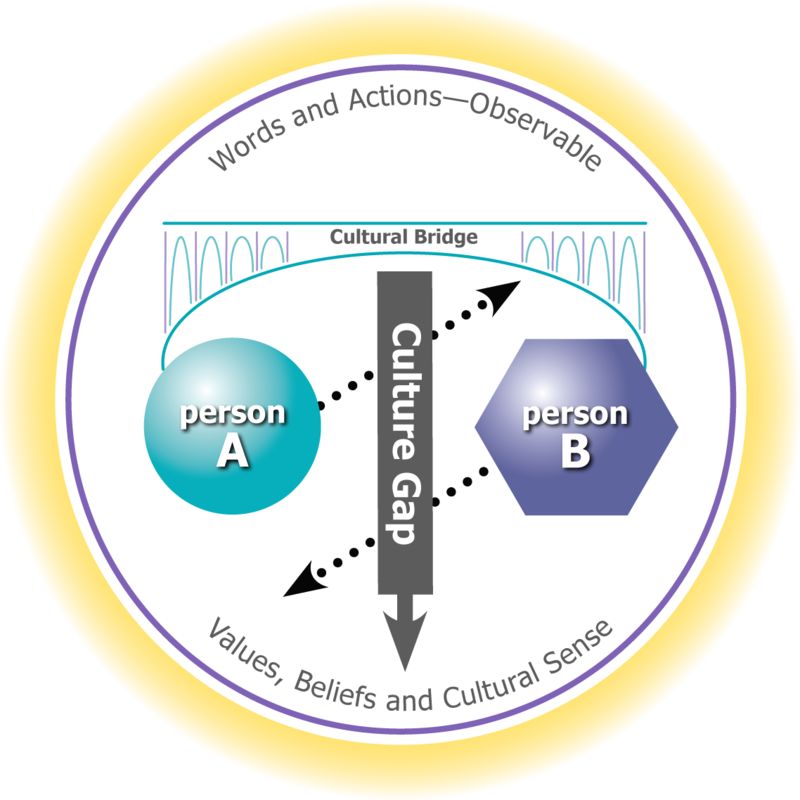 More often than not, in my experience, while nationality(ies) tend to have a strong impact on our behavior, professional training, the culture of the organization to which the person belongs, the team culture, their socioeconomic level, generation, their faith or spirituality … all of these influence behavior as much as or more than national birth culture. It’s worthwhile for all of us to know ourselves in all the layers of our cultures: why we are the way we are, how we got to be who we are today. In this way we can better predict how we’ll respond, and better explain ourselves and our motivations to others, powerfully transforming collaboration. People often ask me, where does personality end and culture begin? As a practitioner, my response is, “Does it really matter? Is there an objective, accurate answer?” We are all unique individuals and we are all also influenced by the multiple cultures in which we’ve grown up, been educated and trained, worked and lived. If we can keep our values and our goals clearly in mind, we can be flexible in our behavior and creative in our approaches, in order to perform at our highest and best in a broad variety of contexts.